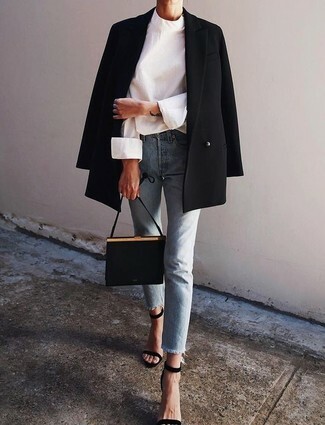 If you're on the lookout for a casual yet absolutely stylish getup, marry a Gucci Stylised Blazer from farfetch.com with black ripped skinny jeans. As well as super comfy, both of these garments look fabulous when worn together. You could perhaps get a little creative in the footwear department and lift up your ensemble with black leather heeled sandals. If you're scouting for a casual yet stylish look, wear a Gucci Stylised Blazer from farfetch.com with black skinny jeans. As well as totally comfortable, both items look great paired together. Sporting a pair of white leather oxford shoes is an easy way to add some flair to your look. If you're looking for a casual yet seriously chic getup, rock a Gucci Stylised Blazer with light blue jeans. As well as very comfortable, these pieces look great when worn together. Rocking a pair of black suede heeled sandals is a simple way to add extra flair to your look. If you're scouting for a casual yet stylish getup, make a Gucci black double breasted blazer and navy skinny jeans your outfit choice. These garments are totally comfortable and look great when paired together. Rocking a pair of black studded leather loafers is a simple way to add some flair to your ensemble. If you're looking for a casual yet incredibly chic getup, try pairing a black double breasted blazer with olive camouflage skinny jeans. As well as totally comfy, these garments look stunning when worn together. Break up your look with more casual shoes, such as this pair of black and white low top sneakers. If you're on the hunt for a casual yet stylish ensemble, team a Gucci Stylised Blazer with black skinny jeans. As well as totally comfortable, both of these pieces look great when worn together. Break up your look with more casual shoes, like this pair of white leather low top sneakers. If you're on the hunt for a casual yet absolutely stylish look, marry a Gucci black double breasted blazer with light blue jeans. These garments are very comfortable and they also look amazing when worn together. Up the cool of your look by finishing off with white leather pumps. For a casually elegant look, try teaming a black double breasted blazer with grey wool dress pants — these two items play nicely together. Go for a pair of white and black leather low top sneakers to make the ensemble current. 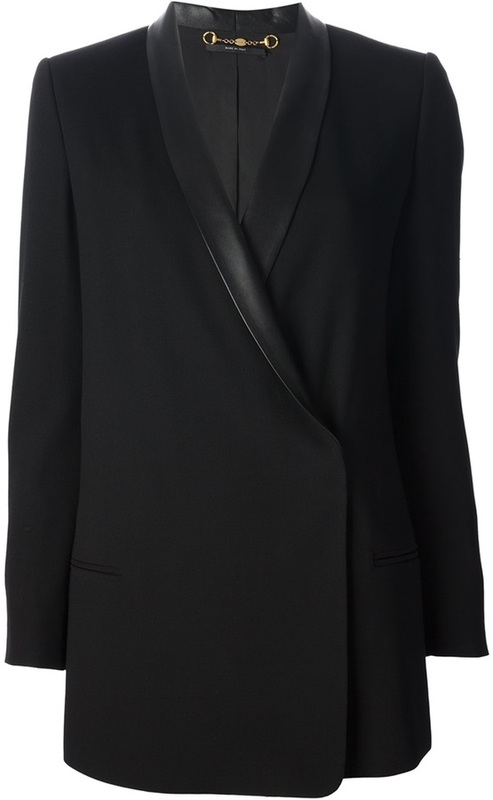 If you're after a casual yet incredibly stylish getup, pair a Gucci Stylised Blazer from farfetch.com with a black leather mini skirt. These two garments are totally comfy and look stunning when worn together.